Morning, afternoon, evening, elevenses, teatime — it doesn’t matter what time it is at the Grand Canyon National Park, this treasured area looks different every day, and every time of the day, of the year. 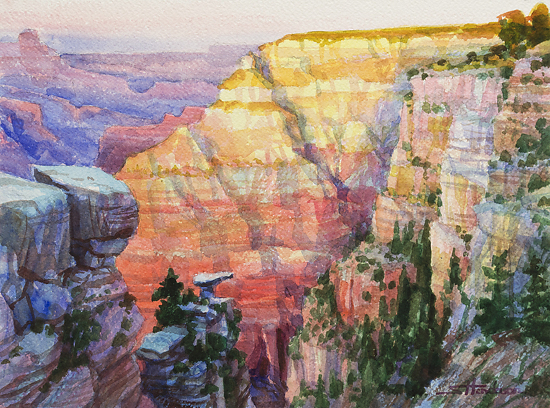 Evening Colors (watercolor on paper, 11 x 14) captures a monolithic rock section just minutes before the sun goes down for the night. Evening Colors, in addition to being available as an original through Steve Henderson Fine Art, is also available for licensing purposes through OC Designer Source. The word awesome has been relentlessly overused, but when it comes to the Grand Canyon National Park in Arizona, awesome is the word that encapsulates the place and the experience. 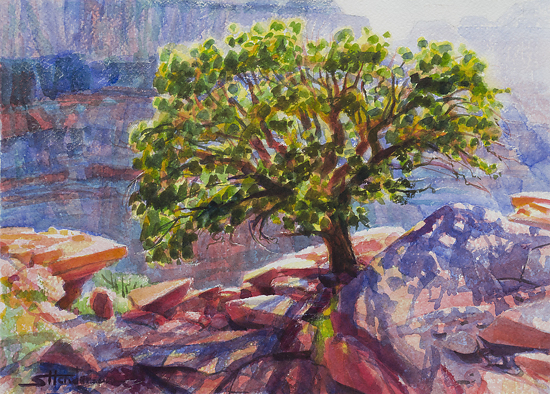 Living on the Edge, original watercolor on paper, 10 x 13 available at Steve Henderson Fine Art. Available for licensing purposes — are you a hotel? an office? a business park? a medical establishment? looking for art on your walls? — through OC Designer Source in Yorba Linda, CA.